Playalinda Brewing Company, the much-anticipated North Brevard craft brewery start-up, will throw open the tasting room doors at 4pm Friday, November 14, 2014. Located at 305 South Washington Avenue in the heart of historic downtown Titusville, Playalinda Brewing Company will launch with 15 house-brewed beers including two flagship beers — Bottomless Blonde Ale and Rocket Man Red Ale – and even a root beer. Ron Raike, Playalinda’s Brewmaster/Certified CiceroneTM, designed the draft beer list to feature a wide range of styles and seasonal offerings. Featuring a 40-foot, custom-built copper bar and custom-built tables, the tasting room has a seating capacity for 50 patrons. The drink rail bordering the brew house, as well as outdoor seating, offer additional space for customers to enjoy the hand-crafted beers. “We want our tasting room to have the feel of a local gathering place, a comfortable living room atmosphere where you come to meet old friends and make new ones,” co-owner Bryan Scott says. Tasting room hours will be Wednesdays and Thursdays 5-10pm, Fridays 4pm-midnight, Saturdays noon-midnight, and Sundays noon-8pm. A short list of simple, pre-prepared food items will also be offered. Raike and his wife Katie have partnered with the Scotts in this joint venture. With Ron’s creativity and extensive brewing prowess along with Katie’s knowledge of the beer industry and tireless work ethic, the Playalinda Brewing team is forging ahead to enhance the beer landscape in Titusville and northern Brevard County. The Raikes, with a combined 27 years of experience in the industry, are excited to commit their knowledge and skills to this budding company. 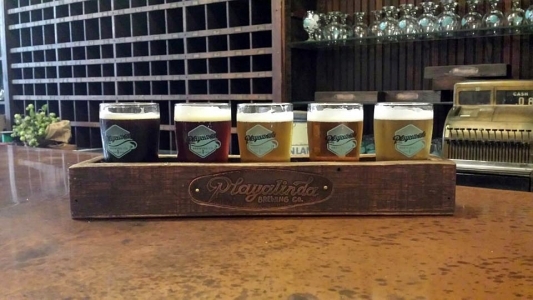 Playalinda Brewing Company is located in the 100-year-old building known locally as the Titusville Hardware Store. The Scotts converted the space into the microbrewery and tasting room while carefully preserving its historical characteristics including the building’s façade, original plaster-and-brick walls, and existing cabinetry.